A fanfare is in order! By the fourth year, an event has certainly become a tradition to look forward to and to follow. 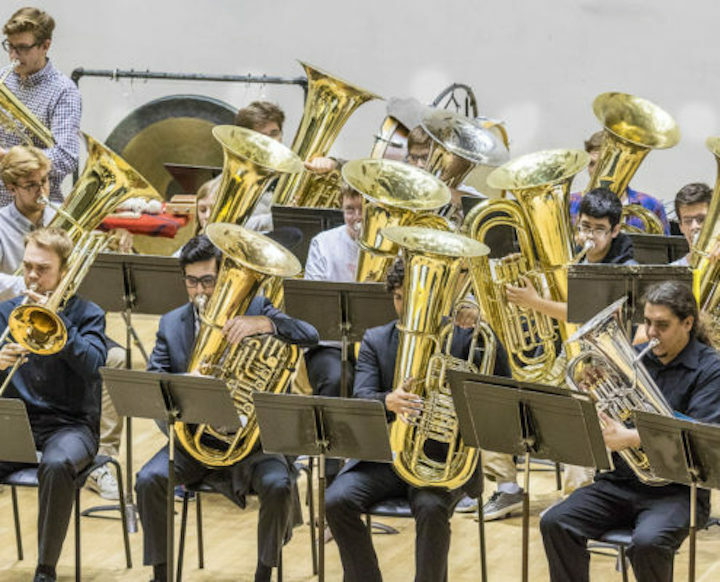 So it is with Brass Fest IV, which will take place this Saturday and Sunday at the University of Wisconsin’s Mead Witter School of Music. 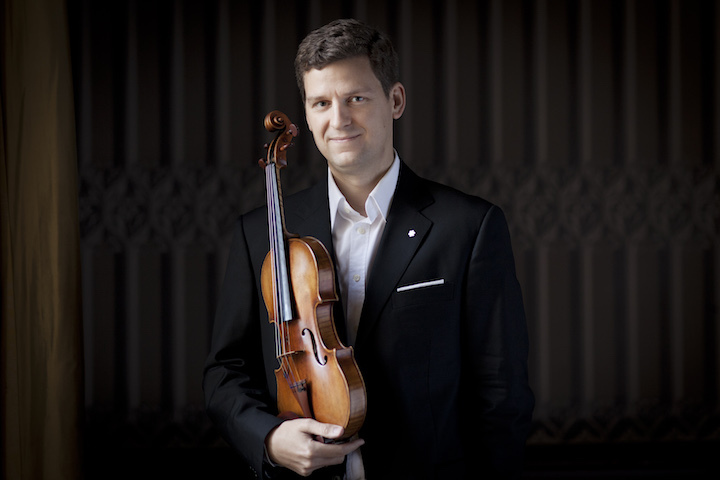 The activities will fill two days with workshops, master classes and concerts. Music by Johann Sebastian Bach and Modest Mussorgsky’s “Pictures at an Exhibition” will be featured, along with many contemporary composers and arrangers. Many of the events, including the big Saturday night concert at 8 p.m. in Mills Hall, are FREE and OPEN TO THE PUBLIC. The special guest this weekend is the Beaumont Brass Quintet from Michigan State University (below). Members are Ava Ordman, trombone; Corbin Wagner, horn; Alessandro Bonotto, trumpet; Philip Sinder, tuba and euphonium; and brass area chair; and Justin Emerich, trumpet. 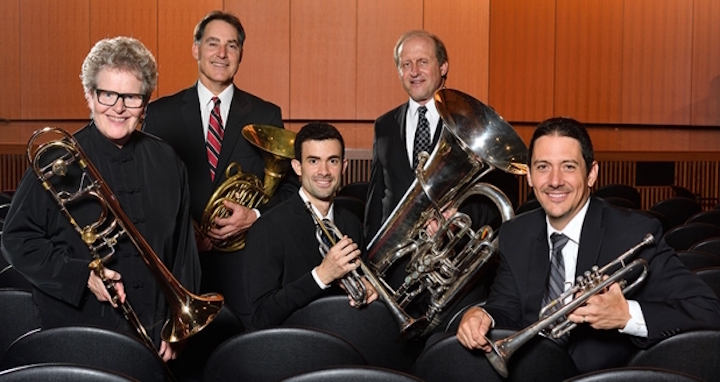 The Beaumont Brass Quintet has recorded a CD of Christmas music for Naxos Records. See the YouTube video at the bottom. 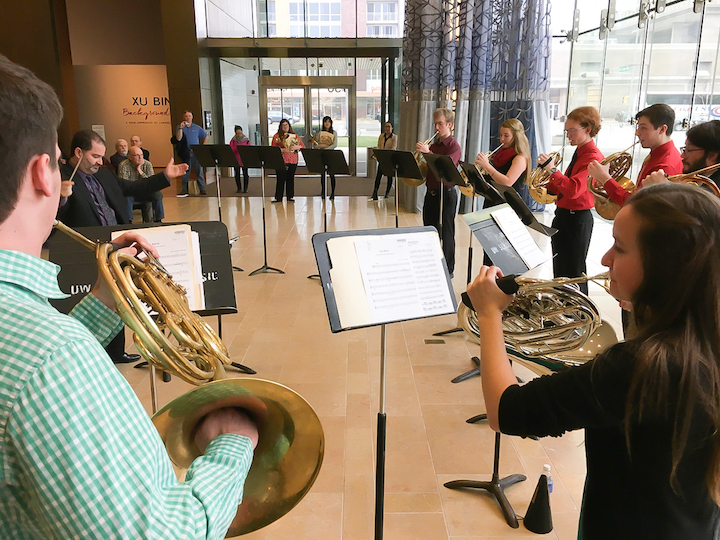 Also appearing with the Beaumont is the UW-Madison’s own Wisconsin Brass Quintet (below, in a photo by Michael R. Anderson). 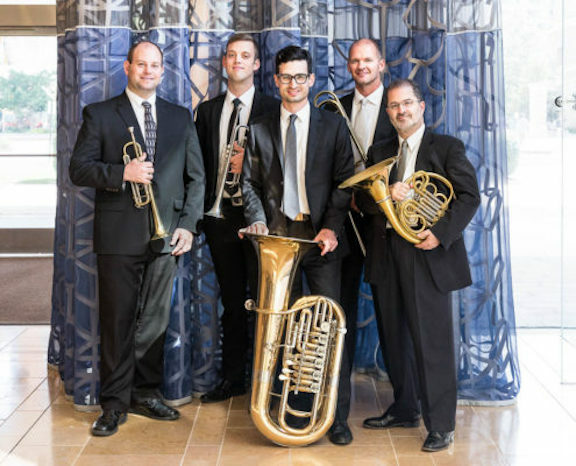 Members, from left, are: Alex Noppe and Matthew Onstad, trumpets; Tom Curry, tuba; Mark Hetzler, trombone; and Daniel Grabois, horn. It seems like one of those situations that put you between a rock and a hard place. Plans for the celebration have been ambitious. Events have included: mounting a special art display at Dane County Regional Airport; publishing a special book; undertaking a foreign concert tour; and holding other events, including special receptions and breakfasts as well as playing opportunities for WYSO alumni who are flying in from all over the country. 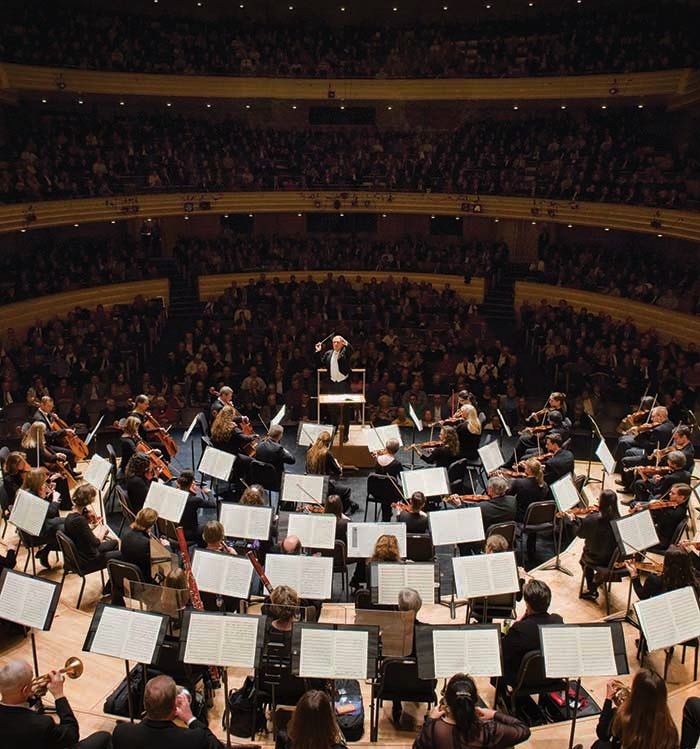 Perhaps the single biggest event is the special concert that will take place this Saturday night from 7 to 9 p.m. at Overture Hall in the Overture Center. 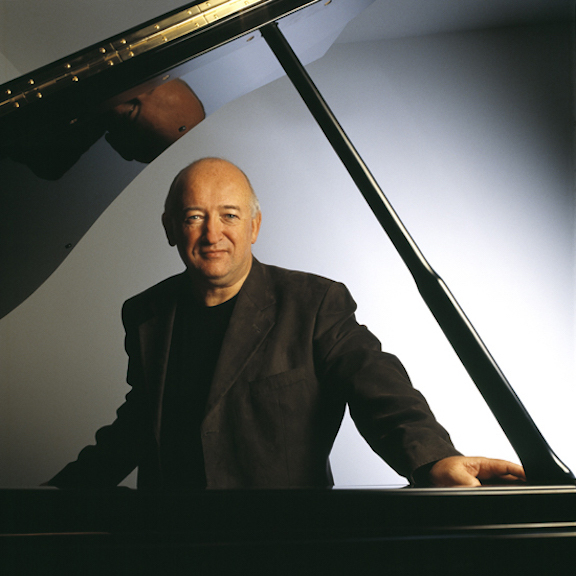 The concert features five world premieres of pieces commissioned by WYSO for five different groups or ensembles. “This concert will be the first time all WYSO orchestras are on stage to perform at the same concert. This concert is generously sponsored by Jerome Frautschi and Pleasant Rowland. 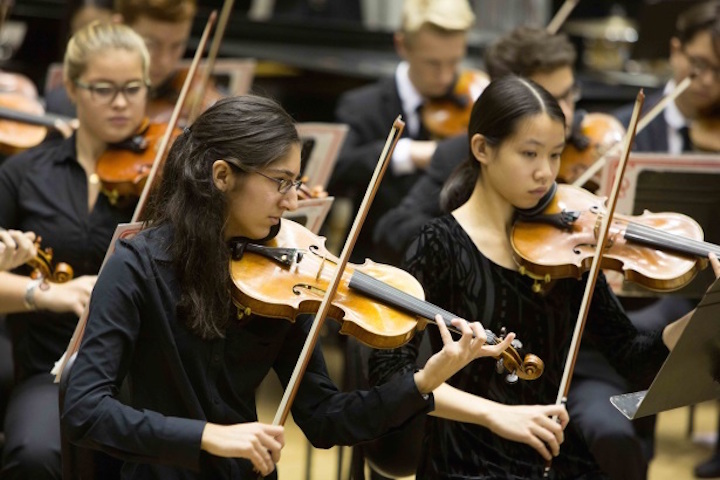 “The collage concert will feature the following performing ensembles: Youth Orchestra, Philharmonia Orchestra, Concert Orchestra, Sinfonietta, Brass Choir, Percussion Ensemble and a chamber ensemble. “Each orchestra along with the Percussion Ensemble will perform a world premiere work that was commissioned especially for them. 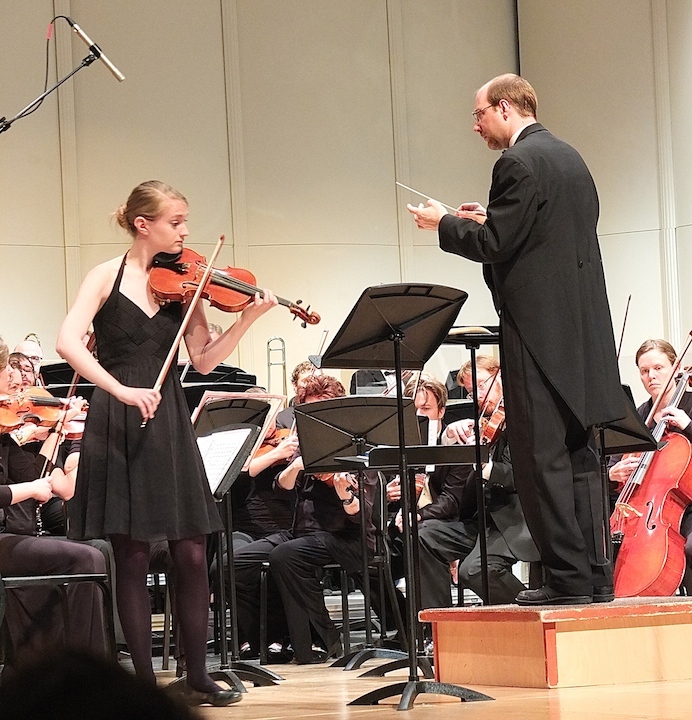 “Composers of these commissions include Ben Whalund, Olivia Zeuske, Reynard Burns, Donald Fraser and WYSO alumni Andrew Kinney. 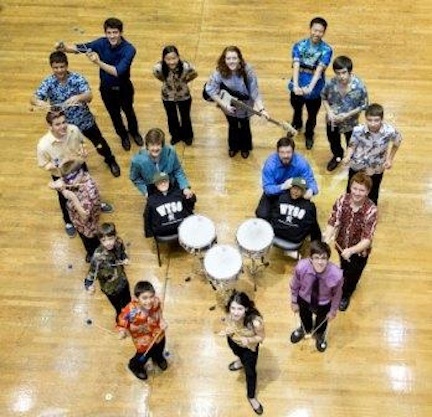 “The Percussion Ensemble (below), under the direction of Vicki Jenks will perform Credo by Ben Whalund. 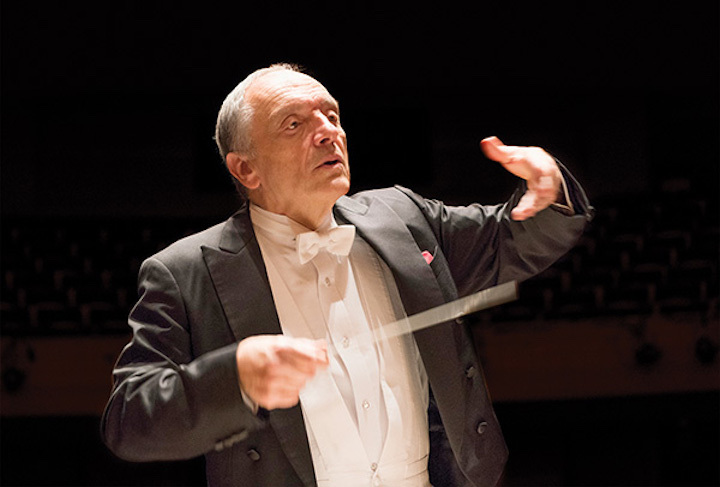 Mark Leiser, conductor of Sinfonietta, will lead his young string orchestra in Sonata for Sinfonietta by Olivia Zeuske, Haydn’s La Chasse, and Duke Ellington’s Don’t Get Around Much Anymore. The Brass Choir, under the direction of Brett Keating will then take the stage. 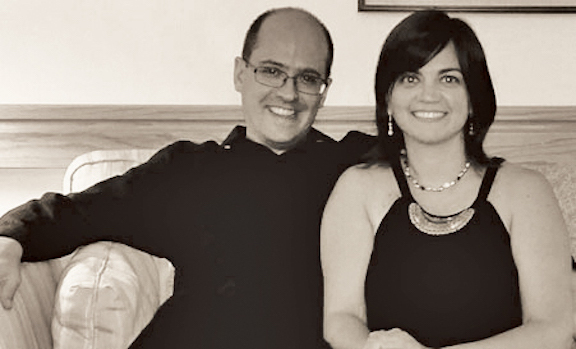 “Following the Brass Choir, Concert Orchestra, under the baton of Christine Mata-Eckel, will perform Biciclette by Reynard Burns, and Del Borgo’s Romany Dances. One of WYSO’s chamber ensembles will perform next. Michelle Kaebisch, conductor of the Philharmonia Orchestra, will lead her ensemble as they perform In Time by Donald Fraser and Throne Room Scene from Star Wars by John Williams. The Youth Orchestra, led by music director James Smith, will give the penultimate performance of the evening by performing A Radiant Spirit by Andrew Kinney a and Symphony No. 2, Finale: Moderato assai-Allegro vivo by Tchaikovsky. 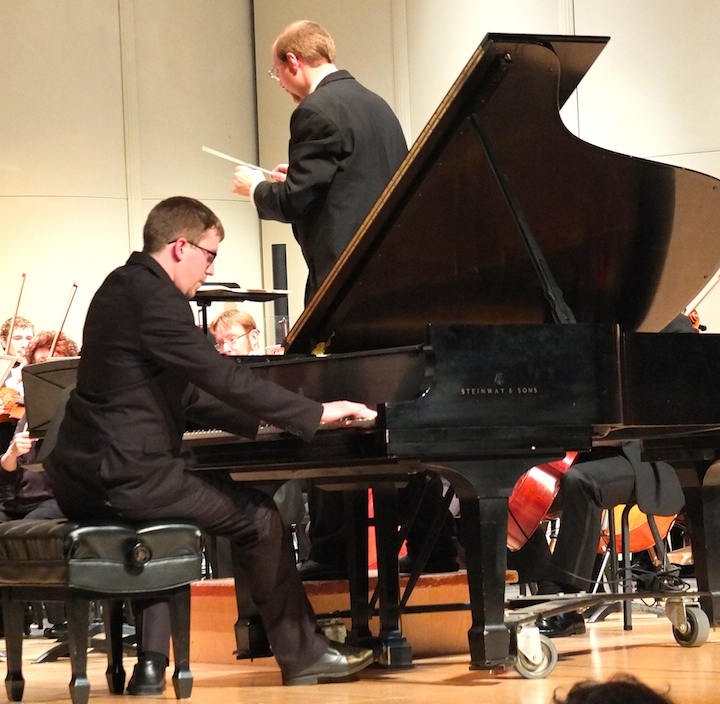 “Following these performances the evening will feature a grand finale, arranged by Donald Fraser, with a performance by all nearly 400 members of WYSO, including the WYSO Music Makers Honors Ensembles as they perform Beethoven’s Ode to Joy. So what is the problem or conundrum The Ear is talking about? Just this: The main concert by the five orchestras and ensembles with five world premiere commissions is SOLD OUT. That is good news because the hall and events are expensive to put on, especially at the Overture Center. So congratulations to the hard work that went into such success. But that is also bad news because The Ear bets that most of the seats understandably went to family, friends and alumni. That, in turn, means that a new public, especially families with young children as potential members, for the ever impressive WYSO – which has trained thousands of middle school and high school students since its inception — will not be reached. 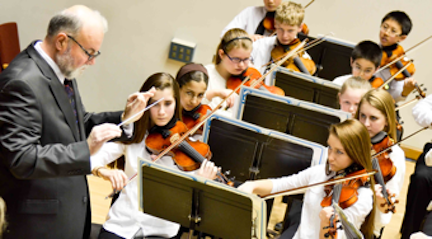 And as a provider of music education, the pioneering WYSO simply has no peers in the area. So The Ear hopes that CDs and DVDs of the concerts will be available after the event. Maybe it will even be aired on Wisconsin Public Television or Wisconsin Public Radio or some other broadcast outlets. 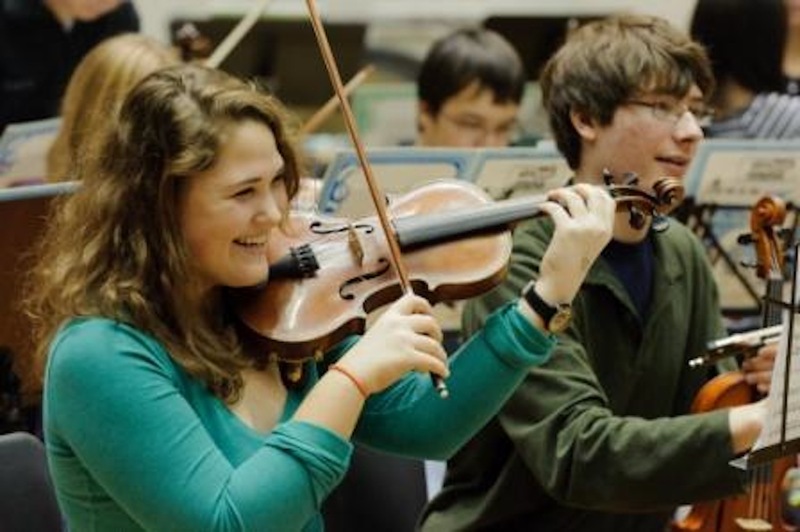 (See the correction at the top: The concert will; be streamed live on Wisconsin Public Television )That would certainly reach a wide public with the inspiring mission and outstanding results of music education through WYSO. Cheers to the next 50 years! 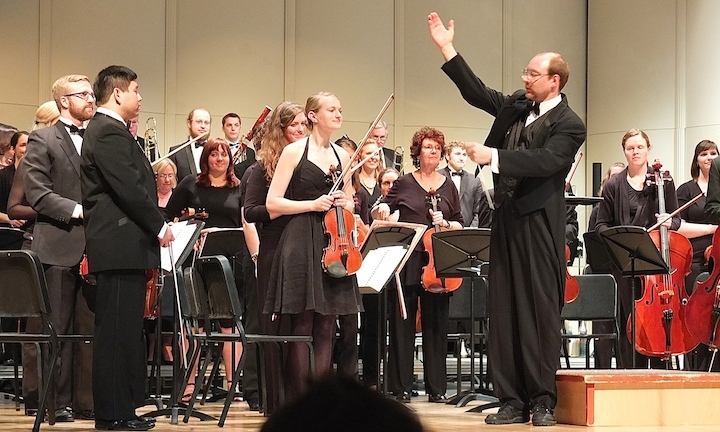 Classical music education: Spring concerts by the Wisconsin Youth Symphony Orchestras (WYSO) start this Saturday and continue on Saturday and Sunday, May 16 and 17. 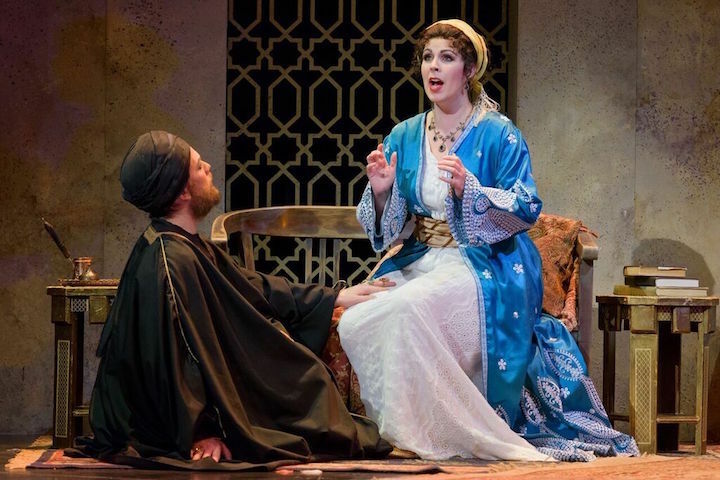 Starting this Saturday, May 9, and continuing on Saturday and Sunday, May 16-17, the Eugenie Mayer Bolz Family Spring Concerts will be held in Mills Concert Hall in the UW George Mosse Humanities Building, 455 North Park Street, Madison. Tickets are available at the door: $10 for adults and $5 for children under 18 years of age. 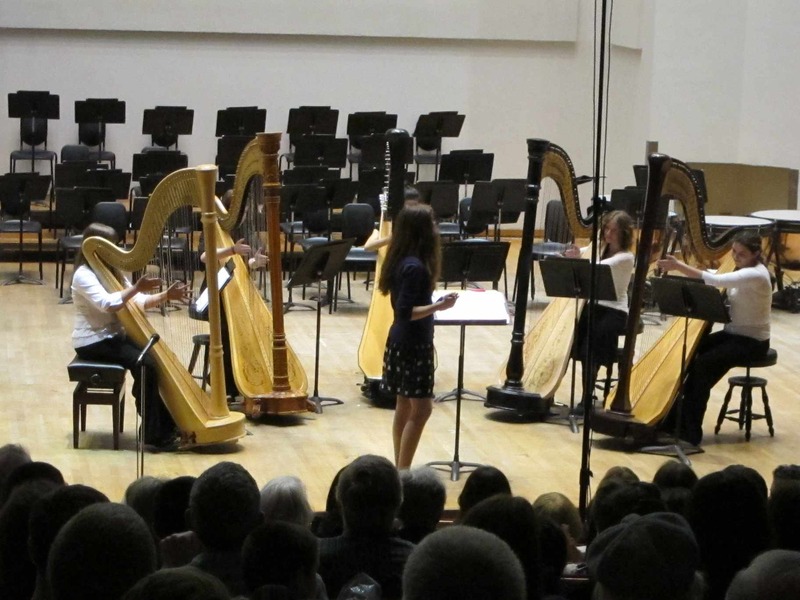 On Saturday, May 9 at 1:30 p.m., WYSO will kick off the concerts with performances by its Percussion Ensemble (below top), Brass Choir, and Harp Ensemble (below bottom). 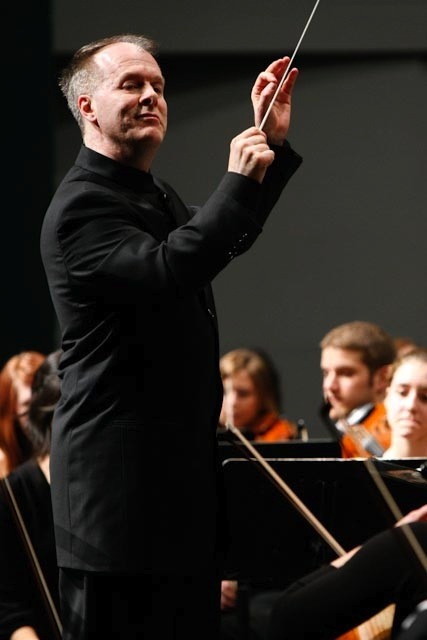 The following week, on Saturday, May 16, the Philharmonia Orchestra will start the day at 11 a.m. They will play four different works that morning beginning with Symphony No. 9, op. 95, E minor “From the New World,” movement 4, by Antonin Dvorak. They will transition to Zoltan Kodaly’s Háry János: Intermezzo followed by two pieces by Wolfgang Amadeus Mozart: The Overture to “The Magic Flute” and the first movement of the Piano Concerto No. 19 in F Major, K. 459. 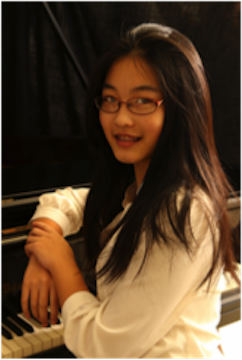 The piano concerto will feature concerto competition winner, Moqiu Cheng. 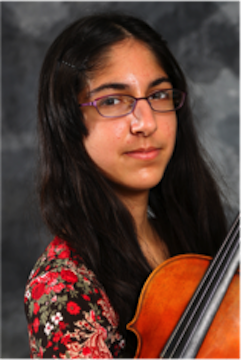 Moqiu (below) is a seventh-grader at Hamilton Middle School and is also a violinist with WYSO. At the 1:30 p.m. concert, the Concert Orchestra will take the stage with Nikolai Rimsky-Korsakov’s Simpson Dance of the Tumblers from ‘The Snow Maiden’. Hatikvah, a traditional tune arranged by Del Borgo is next followed by Richard Meyer’s, Tales of Vandosar. They will end their set with Robert Sheldon’s Triumph of the Argonauts. 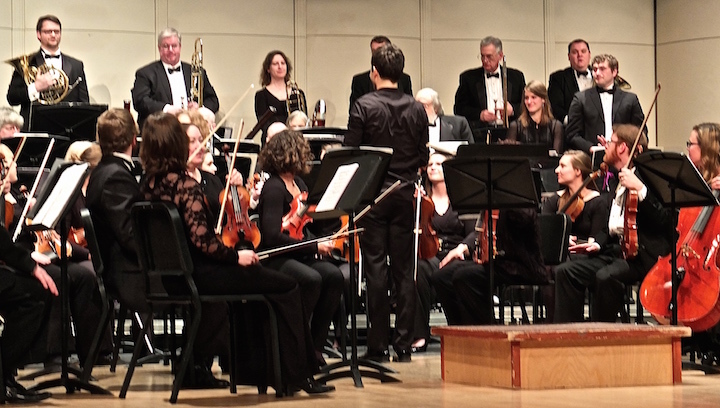 Following the Concert Orchestra, WYSO’s string orchestra, Sinfonietta will end the day’s performances with several pieces including The Abduction from the Seraglio: Overture by Mozart, Richard Meyer’s, Carpe Diem!, and the Allegro from Sinfonia No. 6 in G minor by Johann Christian Bach. 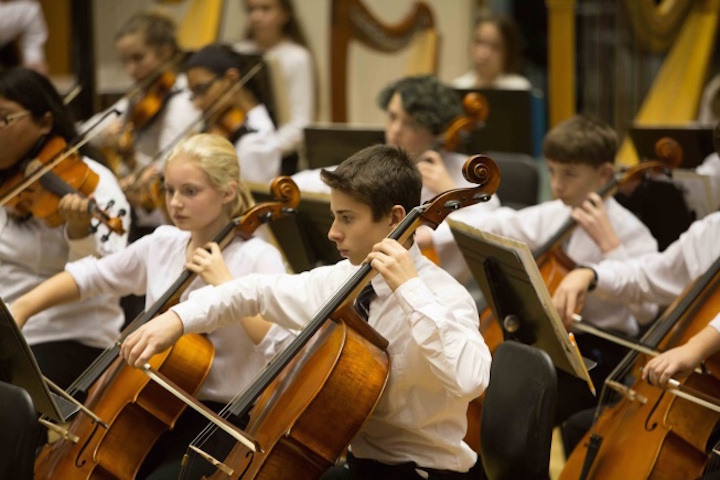 On Sunday, May 17, at 4 p.m., the Youth Orchestra (below top) will take stage at OVERTURE HALL — NOT Mills — along with the Wisconsin Chamber Orchestra (below bottom) in a side-by-side concert. 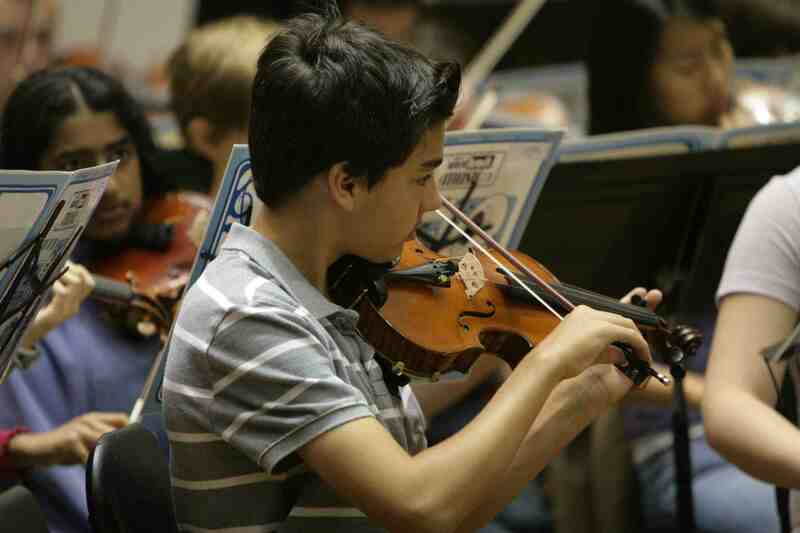 The program will feature five different works showcasing the abilities of both orchestras. They will start with the Festive Overture by Dmitri Shostakovich’s. 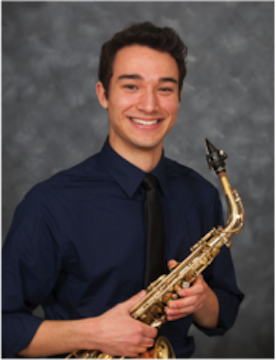 Following that Soloist Adam Yeazel (below top), a senior at Middleton High School, will perform the Concertino da Camera for Alto Saxophone by Jacques Ibert. That will be followed by the cadenza and fourth movement of Violin Concerto No. 1 by Shostakovich featuring sophomore Maynie Bradley (below bottom) as the soloist. After a brief intermission the program will continue with Sir Edward Elgar’s Enigma Variations – including Theme I, VII, VIII, IX, XI, Finale and end with Pictures at an Exhibition by Modest Mussorgsky in an orchestration by Maurice Ravel. 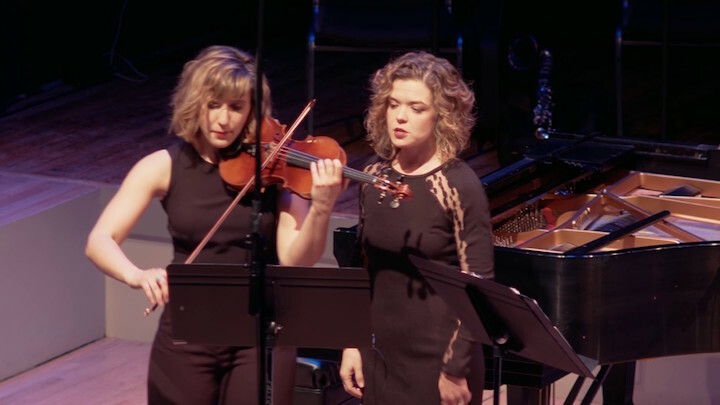 This is the third “Side by Side” collaboration between the Wisconsin Chamber Orchestra and WYSO. The public is invited to this free concert. Reservations must be made by calling the Wisconsin Chamber Orchestra office at (608) 257-0638. Please note that places are being reserved for this concert, but there will be no tickets. Seating is General Admission. 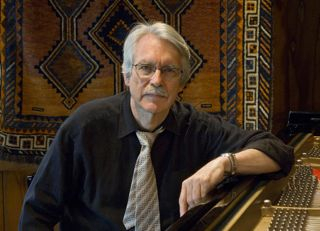 For more information please visit www.wcoconcerts.org. 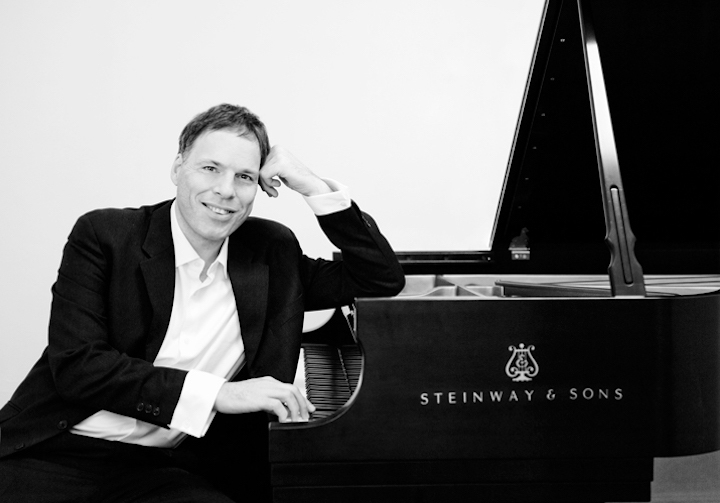 These concerts are generously supported by the Eugenie Mayer Bolz Family, along with funds from Dane County, the Endres Mfg. Company Foundation, The Evjue Foundation, Inc., charitable arm of the The Capital Times, W. Jerome Frautschi Foundation, and Pleasant T. Rowland Foundation. 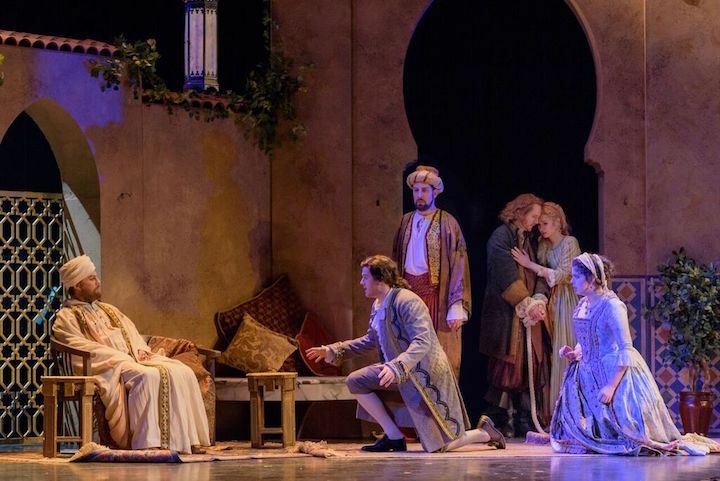 This project is also supported in part by additional funds from the Wisconsin Arts Board, the State of Wisconsin, and the National Endowment for the Arts. 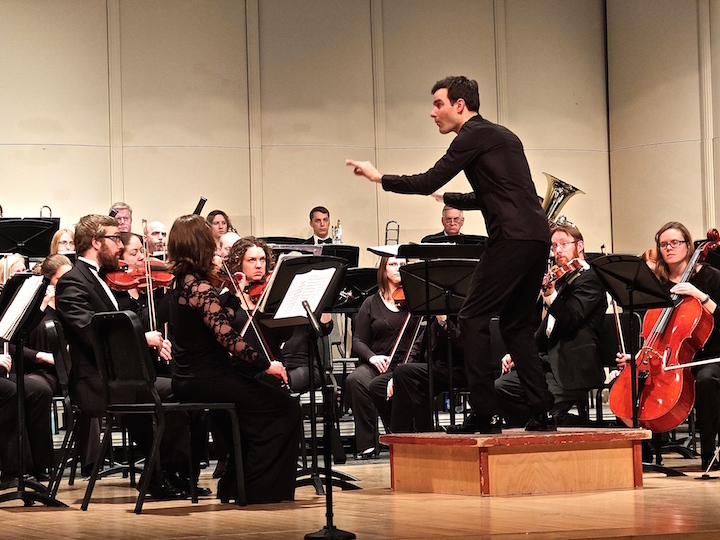 Classical music: The Middleton Community Orchestra, under conductor Kyle Knox, turns in its most impressive performance so far. The brass proves especially noteworthy. 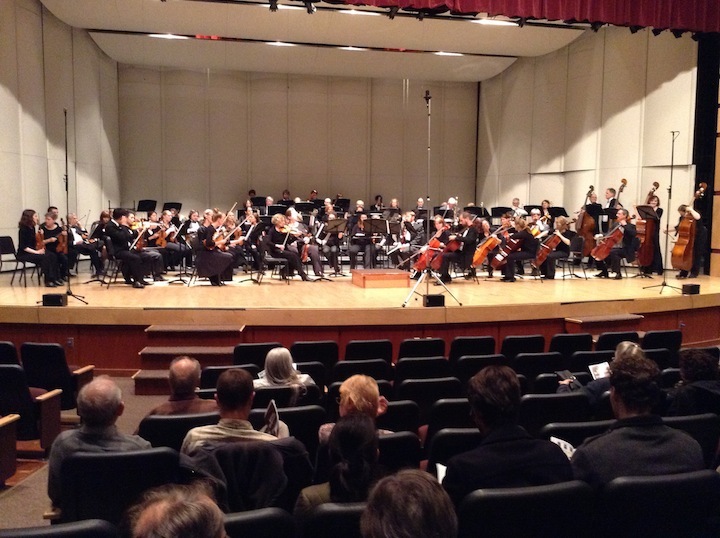 The concert by the Middleton Community Orchestra (below) on last Wednesday night at the Middleton Performing Arts Center, at Middleton High School, drew an audience little deterred by snow and slow traffic, and greatly rewarded by the results. 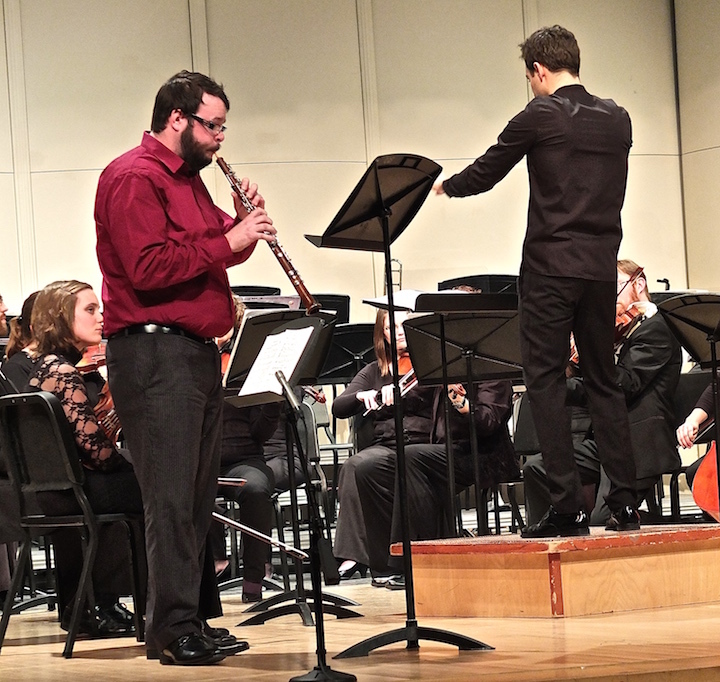 The orchestra appeared this time under a guest conductor, Kyle Knox, who has prior and future connections with it and who is currently both pursuing graduate studies and conducting at the University of Wisconsin-Madison School of Music. 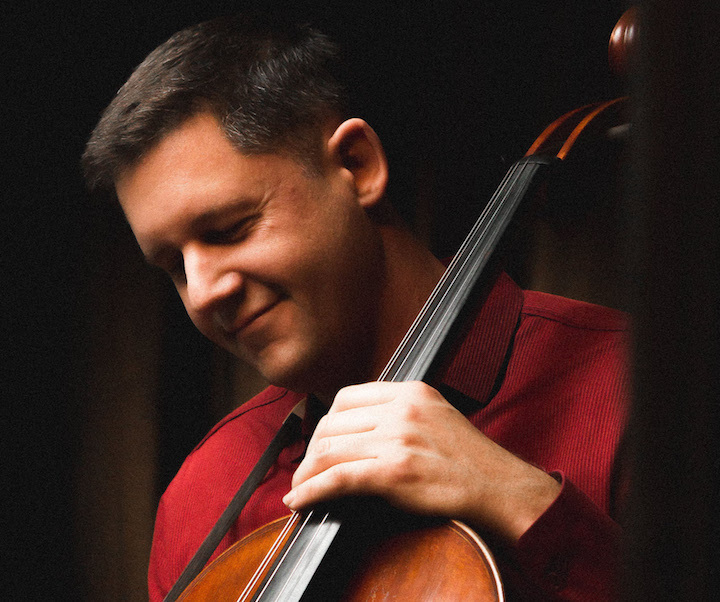 Knox (below) is a musician of very distinct talents: a knowing perspective on the works he conducts, a propensity for well-thought phrasing, and an ability to achieve definite rapport with his players. The MCO delights in taking on compositions that are both challenging and quite familiar. 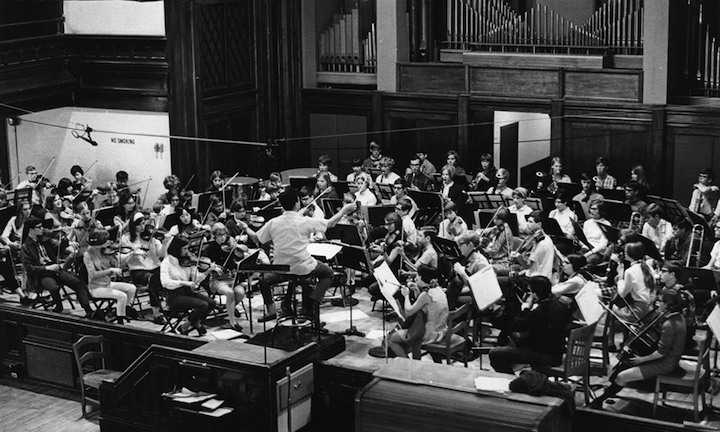 In testing themselves thus, the orchestra invites its listeners to measure its progress against the orchestras that have set extremely high performing standards in concerts and recordings. So it is proper that we do just that, especially in the beloved music from the score for the Incidental Music to “A Midsummer Night’s Dream” by Felix Mendelssohn. The conventional five movements were played. 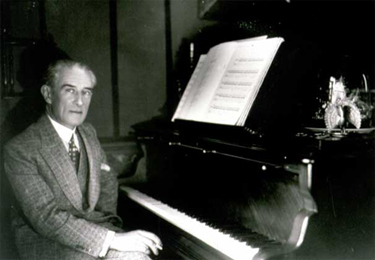 In the fabled Overture, the strings had some struggles with their extremely demanding parts, but generally Knox achieved a well-integrated balancing of the elfin and the eerie. Perhaps to avoid straining the players too much, Knox set a slightly slow tempo in the fairyland Scherzo, which sagged just a bit, but the Intermezzo was beautifully shaped. The Wedding March was also marked by a bit of ragged playing, but Knox paced it nicely and integrated it successfully. Overall, they get good marks for showing distinct progress in some very satisfying Mendelssohn. 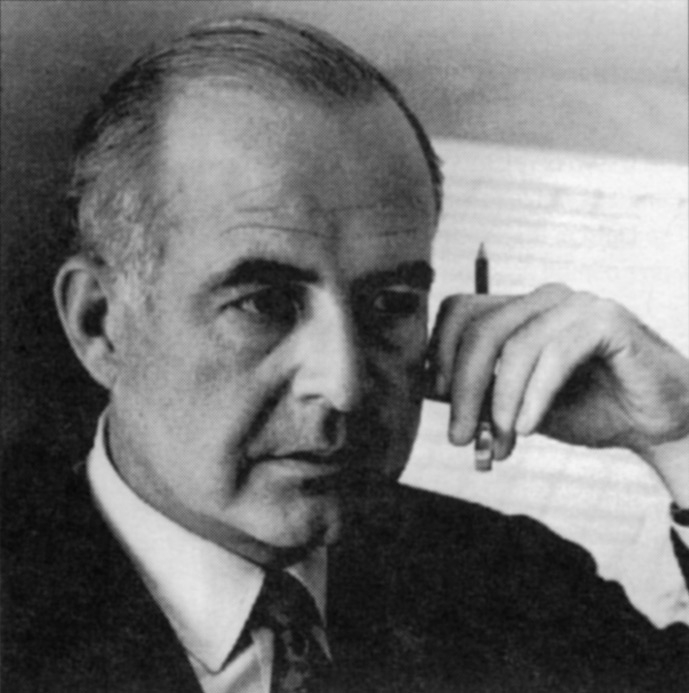 The novelty of the program was the rarely played Canzonetta for Oboe and Strings by the 20th-century American composer Samuel Barber (below). This was a late work, the only completed movement of what was to be a full-length oboe concerto, and was published posthumously. It displays the familiar qualities of Barber as the pre-eminent American neo-Romantic, in music that is gentle, gracious and lyrically flowing. But it also highlights another feature of Barber: the composer’s identification with the human voice. 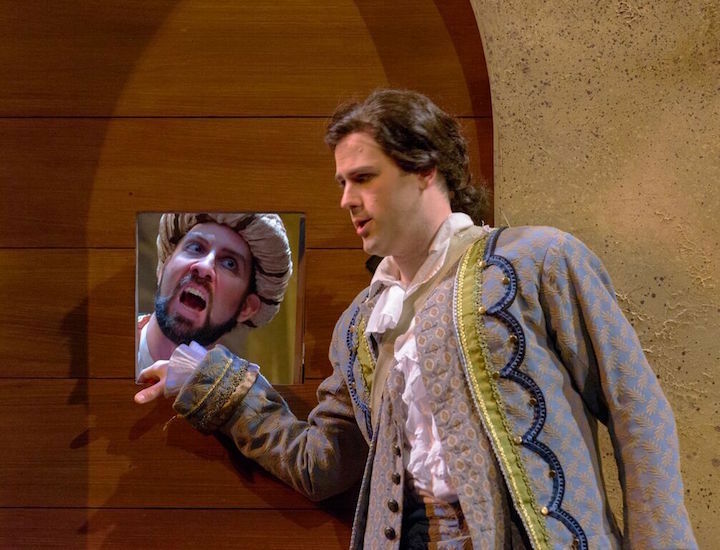 A fine singer himself (he was a baritone), Barber was a master of song and vocal music, and the solo oboe part is, to a considerable degree, a kind of song — as the title says, a “canzonetta” or small song. 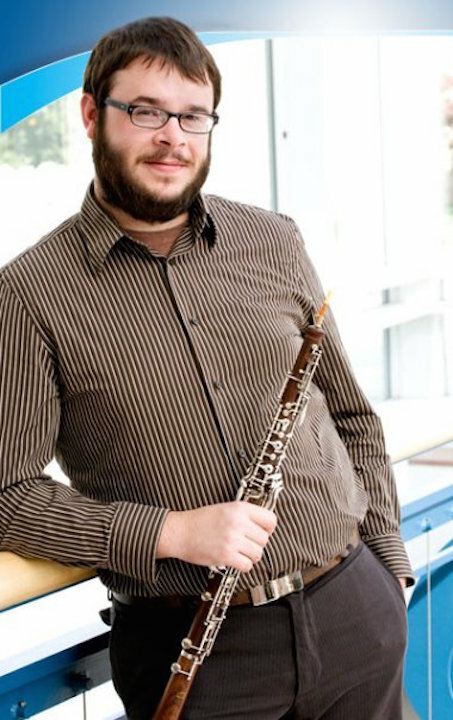 The oboe soloist, Andy Olson (below), with his own long affiliations with the MCO, clearly recognized this characteristic, and realized it in his beautiful playing. 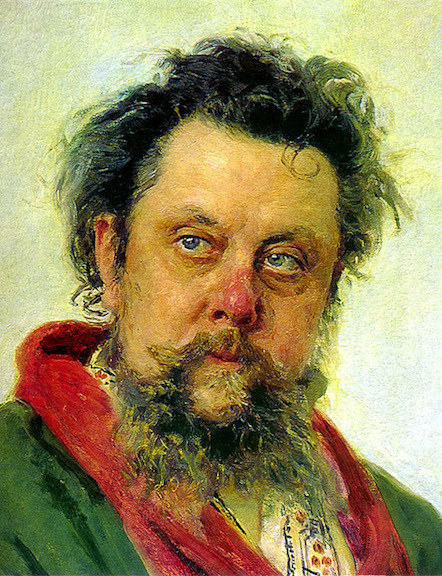 For the finale, the other super-familiar score, was the dazzling — and very tricky — orchestration by Maurice Ravel of the solo piano suite Pictures at an Exhibition by Russian composer Modest Mussorgsky (below). At the very outset, in the opening “Promenade,” the brass section displayed a new level of power and ensemble. The saxophone solo in “The Old Castle” was truly compelling. The heavy cartwheels of “Byddlo” were inexorable, and “The Hut on Fowl’s Legs” or “Baba-Yaga” (a sorceress) was truly ferocious. The triumphant final movement, “The Great Gate of Kiev” was stunning. One feature of old Russian city portals was the inclusion of working chapels. I have never heard the hymn-like quality of the whole piece, with its interludes of liturgical chanting and tolling bells, so successfully evoked. Overall, this performance was magnificent, and I have never heard this orchestra play so well. The MCO has proven itself to be, more than ever, a really extraordinary factor in the Madison area’s musical life. 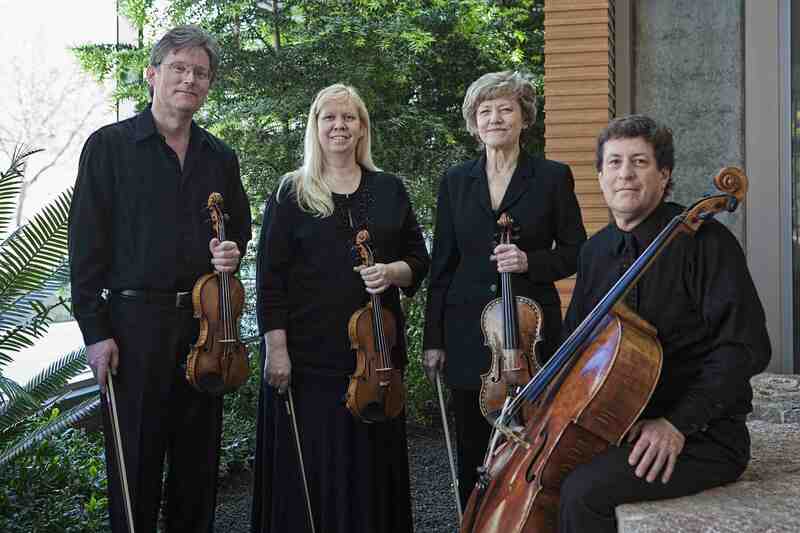 It is a non-, or semi-, or extra-professional ensemble whose music-making is truly inspirational. Its concerts should be supported and enjoyed by all our cultural community. Classical music: It’s time to go back to the future. 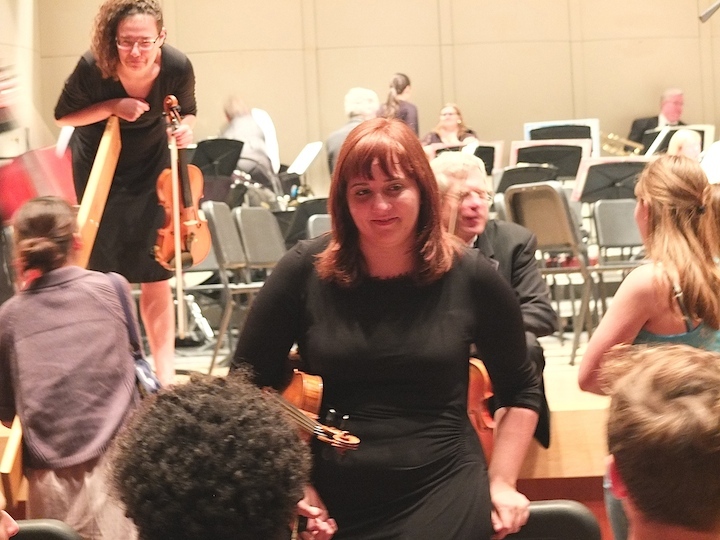 The classical music scene needs more professional groups to act like the Middleton Community Orchestra and break down barriers between performers and listeners. There was a time when no professional symphony orchestras existed, at least outside of royal courts. Even Ludwig van Beethoven had to hire freelance pick-up orchestras to premiere his monumental and iconic symphonies and concertos. That meant that classical music was much more of a home activity and much more of a community affair that it usually is today. 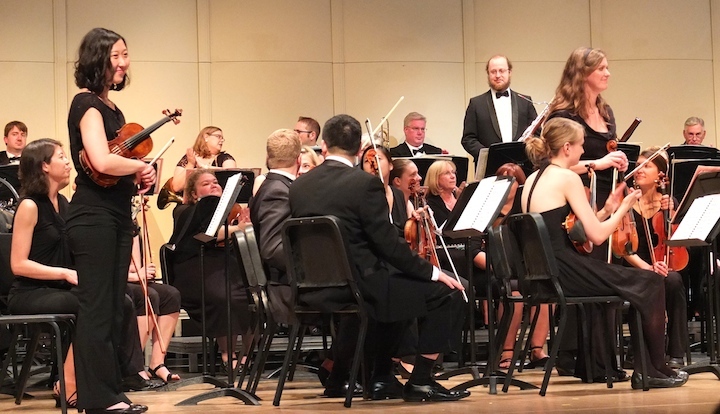 I was reminded of that on Wednesday night when – in the Middleton Performing Arts Center that is attached to Middleton High School — I attended the concert that closed the fourth season of the Middleton Community Orchestra (below). 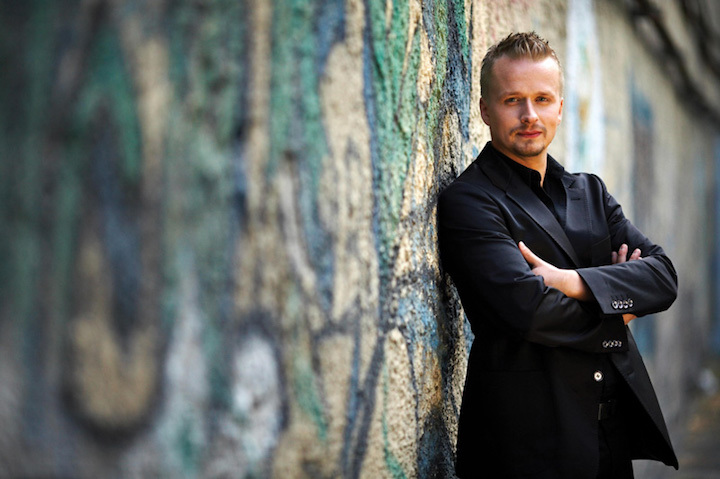 As I sat there, I realized I was simultaneously getting a glimpse of both the past and the future of classical music, which is under siege and needs some new strategies to thrive and prevail if it is to attract new and younger audiences. 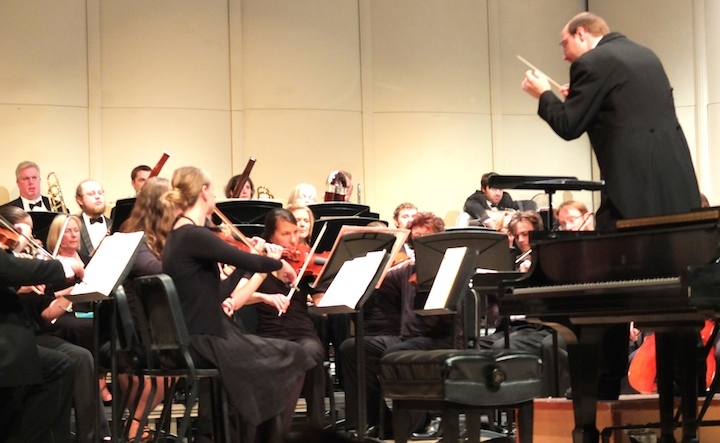 I have written before about why I like the Middleton Community Orchestra so much. But this most recent concert only deepened and expanded those convictions. First and foremost, I liked the way the barriers between the performers and the audience members were broken down. 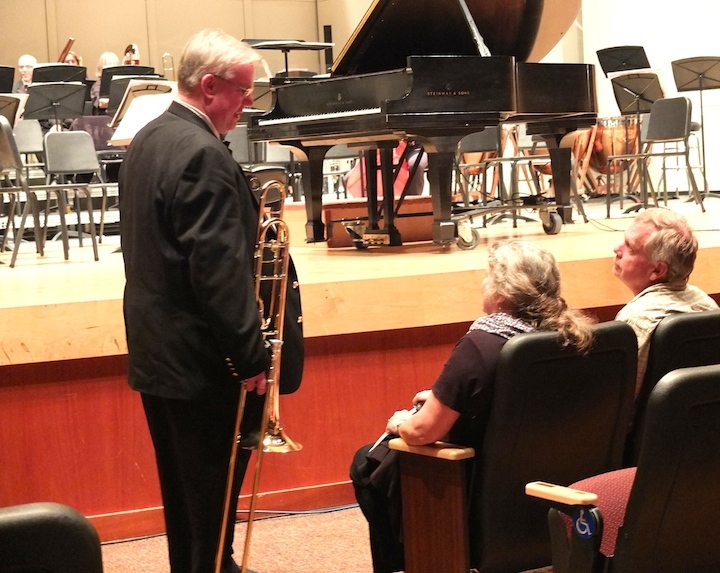 I took some photos of what I saw: brass and string players talking with friends, family members, admirers and strangers both before the concert, during the intermission and then during the social dessert reception after the concert. It all made the act of music-making seem more humane, more do-able, more central to daily life. Music seemed a cohesive bond for the entire community. I also liked that the community orchestra –- which used some professional members but also many amateur musicians — once again turned in convincing readings of great music. And they did so by once again spotlighting local talent. 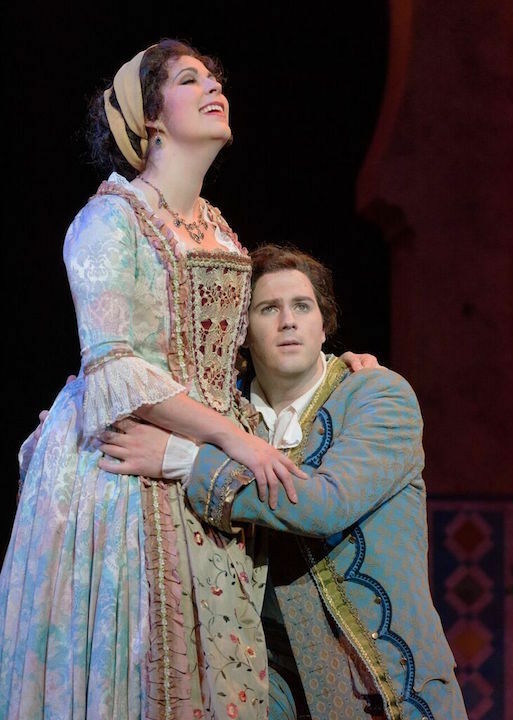 One was pianist and Middleton native, Thomas Kasdorf, who did his undergraduate work at the University of Wisconsin-Madison School of Music and who returns there in the fall for a graduate degree. 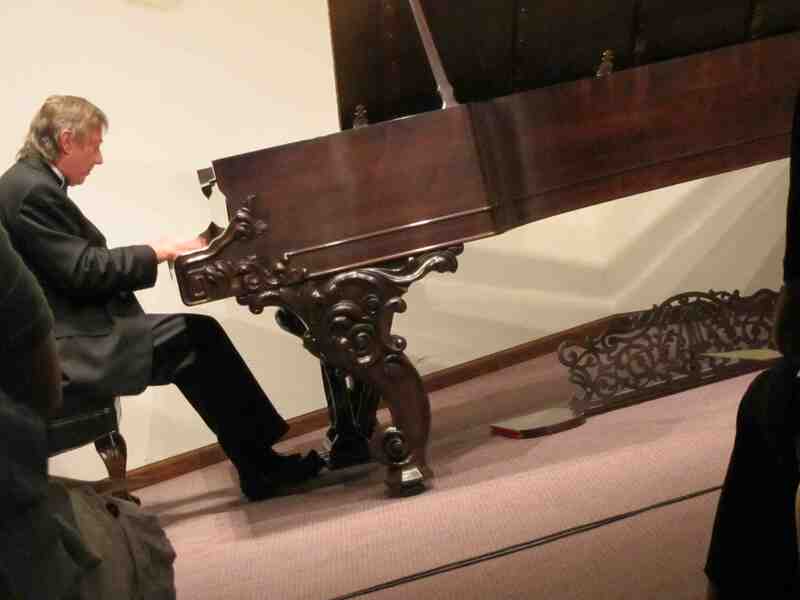 Kasdorf played with dynamism and lyricism, drawing a big sound out of the smaller-than-concert grand Steinway. He captured the many moods and beautiful tunes, the infectious rhythms, the long and songful phrases, and the stirring harmonies of Grieg’s evergreen concerto. 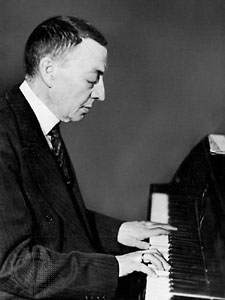 No less than pianist-composer Sergei Rachmaninoff (below) told Arthur Rubinstein that the Grieg Piano Concerto was the best and most effective piano concerto ever composed. And Rachmaninoff, who himself used the Grieg as a model, knew a thing or two about composing and performing piano concertos. Kasdorf wasn’t alone in excelling. I also loved the audience. I don’t know them by name, but enough people were there that the house seemed plenty full. 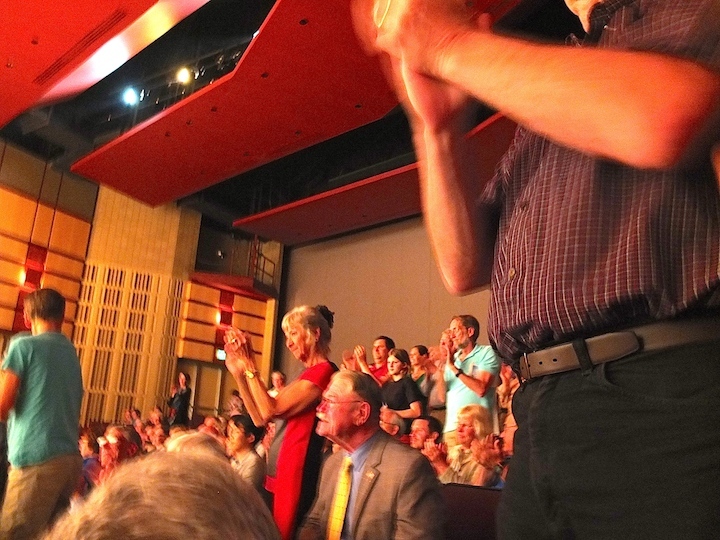 Moreover, many of the listeners were very young or looked like people you don’t usually see at events like the Madison Symphony Orchestra or the Wisconsin Chamber Orchestra. Well, one reason is that the price is right. WCO admission has two prices: $10 for adults and free for students. At that level, who can’t afford to take a chance? It might be nice if bigger groups tried cutting costs instead of increasing them. Affordability begets accessibility, The Ear suspects. The orchestra, of course, also played on its own. It gave a respectable and at times moving reading to Sir Edward Elgar’s ambitious musical portraits in the “Enigma” Variations. As happened in also in the Grieg, I found especially the brass and percussion outstanding, though all sections, and especially the strings and winds, also held their own and had much to be proud of. That’s not to say there weren’t mistakes or lapses or shortcomings. But, hey, this isn’t the Berlin Philharmonic. Besides, imperfection is an inherent part of most performing arts. But the orchestra clearly communicated the music’s emotion to the audience, and that is what matters most. And there was my one criticism. This concert was just a bit too long. People were tired, especially on a weekday night. And beside, it is nice to get in The Zone and then leave The Zone –- and not try to renter the Zone after intermission. It is also nice to get back home early when work is facing you the next day. 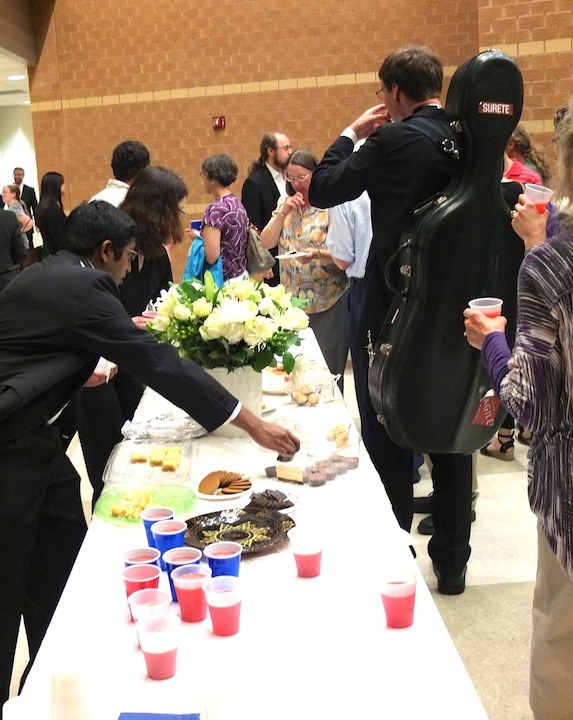 Then came the FREE desserts and the chat between hungry musicians and hungry audience members. But it seemed everyone left with their appetite for music satisfied. So congratulations then to the MCO co-founders Mindy Taranto and Larry Bevic plus conductor Steve Kurr. 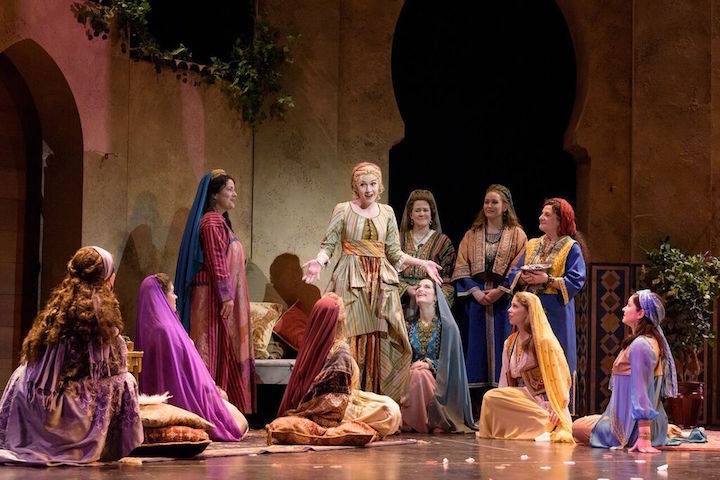 Over four seasons, they have grown an experimental project into a new tradition that seems to be attracting more people who appreciate them -– as you could tell from the cheers and hearty applause and prolonged standing ovations. Next season promises very good things: Beethoven’s Symphony No. 7 and Dvorak’s Symphony No. 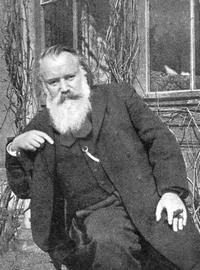 8; Rachmaninoff’s Symphonic Dances and Modest Mussorgsky’s “Pictures at an Exhibition”; the famous “William Tell” Overture (the “Lone Ranger” theme) by Giacchino Rossini and the Academic Festival Overture and Tragic Overture by Johannes Brahms; plus Thomas Kasdorf again in the great Piano Concerto No. 1 by Tchaikovsky (with, three cheers, Thomas Kasdorf as soloist in what The Ear jokingly calls the Van Cliburn Piano Concerto No. 1) and more. All that music and all that fun for all that affordability. See you then, see you there!